1-800 WATER DAMAGE ™ is a low overhead, recession proof, and simple to operate water damage restoration franchise. When water damage occurs, we use modern technology and equipment to dry customers' homes or businesses in just a matter of days. The majority of jobs we perform are emergency service and most often are paid for by the insurance industry. Insurance companies prefer to professionally dry out a water damage related mess and avoid future mold mitigation, then to deal with expensive rip out or a job poorly done. This and other factors make this a truly recession resistant business, which is certainly an important consideration when choosing your new business in today's economy! When do people call 1-800 WATER DAMAGE? 1-800 WATER DAMAGE is the number to call whenever a house, apartment complex, condo, hotel or office building has any type of wet mess. All sorts of every day problems create a water damage emergency—frozen or broken pipes spew water everywhere; washer or dish washer pumps water to the wrong place; water heater breaks; toilet overflows; septic tank back fills; ceiling sprinkler system activates; water floods in from an outside source; and countless other incidents where the number to call is 1-800 WATER DAMAGE. In fact, a huge proportion of insurance claims involve water damage! Previous industry or related experience is not required. Our best franchise partners come from a variety of diverse backgrounds. Franchise partners receive personalized training and hands-on experience in each skill area of their business--marketing, administration, and technical. Our operations manual, active coaching programs, and growing database archive of support webinars on various topics keep you on track and focused. The 1-800 WATER DAMAGE franchise system is an outstanding opportunity to build a new business for your self, but not by your self. It all starts with two weeks of comprehensive training at our national training and support center in Seattle, Washington, followed by one week of set-up training at the franchise location. Our proven systems and active coaching programs help franchise partners reach their goals each day, week, month and year. The 1-800 WATER DAMAGE team of experienced professionals is dedicated to your success! Our state-of-the-art national training center includes a "floodhouse", one of only a handful in the country. This allows franchise partners to work with a wide variety of building materials in a structured learning environment. 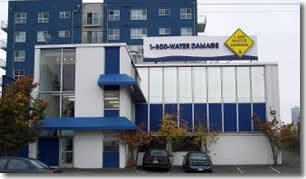 1-800 WATER DAMAGE™ is a low overhead, recession proof, emergency water damage restoration franchise. 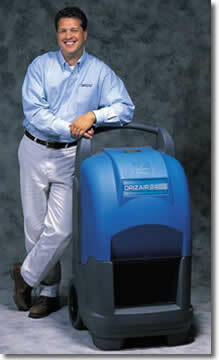 When water damage occurs, we use modern technology to dry customers' homes or businesses in a matter of days. Because the majority of jobs we perform are insurance related and paid for by the insurance companies, the economy virtually has no afftect on us. 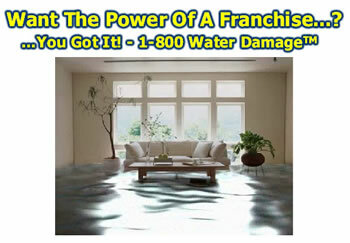 For the first time in the history of 1-800-WATER DAMAGE™, we now offer the home based franchise opportunity. More people now, will have the chance to experience the benefits of our standard franchise at a fraction of the cost. Do you want an exclusive territory where you live? Act now and fill out the form before your exclusive territory is sold out. The Home-Based franchise model allows for qualified franchise candidates to get started with less initial investment capital in smaller markets. Whereas, the Executive franchise model is better suited for business professionals with ample investment capital to build a successful business in larger markets. Learn more about the 1-800 WATER DAMAGE franchise opportunity by tuning into our weekly webinar! We'll provide more detailed information and cover the most frequently asked questions in as little as 30-40 minutes. Find out how 1-800 WATER DAMAGE can make your dreams come true. Please note this franchise is not currently accepting inquiries from CA or from outside the U.S. Interested parties should have at least $50,000 to invest. Click on Request Information button above for FREE information on how to start a 1-800-WATER DAMAGE franchise today! Please Note: 1-800-WATER DAMAGE franchises for sale, and other franchise opportunities, business opportunities, businesses and franchises for sale on this web site are not to be considered as an "offering", "franchise offering", suggestion or recommendation by GlobalBX. The franchises, businesses and business brokers seen on this web site submit their own individual content. This advertisement depends entirely on the truthfulness of the information provided by our advertisers which includes, but is not limited to, franchisers, franchises, franchise brokers, franchise consultants, business sellers and business brokers. As always, GlobalBX recommends that you consult a lawyer, financial consultant, accountant or professional advisor before buying a franchise or business opportunity or any type of business. By submitting this form and requesting more information, you have agreed to all terms and policies of GlobalBX and the business and franchise offerings listed here. Please review our Terms & Conditions for more information.